Thanks to the globalisation of fashion, technology and retail, high street shops, malls and designer stores across the world are becoming increasingly indistinguishable. If you are planning to shop for Eid gifts abroad, make it count by seeking out retail experiences with a distinctive local flavour. Melburnians love an event, even if it’s just glorified grocery shopping, so make like the locals and browse the stalls for everything from food to fashion. The venerable Queen Victoria Market is a great, albeit somewhat overwhelming, place to start. Selling a range of products that includes fresh fruit and veg, but also Australian opals and handmade fairy costumes, it’s a sprawling, bustling, maze of vendors. Don’t miss the beautiful Art Deco deli hall – there’s no certified halal stall, but err on the safe side by picking up an essential Melbourne souvenir: small-batch, single-origin specialty coffee. For local talent-spotting, visit one of the weekly markets selling arts, fashion, craft and design. The Rose St. Artists’ Market in Fitzroy is the most popular choice, but new contenders keep popping up, like the more centrally located Bend and Snap Market, beachside St Kilda Esplanade Market or annual events like Finders Keepers and Big Design Market. Best time to go: Melbourne can be miserable in antipodean winter and unbearably hot in summer, but spring and autumn are usually just right. Where to stay: The Art series hotels, each named after an Australian painter, are the most original boutique hotels in town. You can even shop the rooms, from designer pillow covers to the eponymous artists’ prints. Some travellers choose their hotel for proximity to a city’s shopping district, others struggle to rush to the stores on a business trip, but what if you could shop without ever leaving your hotel room? Amsterdam’s Nine Streets district is great for small-boutique shopping, with countless unique concept stores, design showrooms and vintage shops dotted along quaint canals and the adjacent cobblestoned streets. 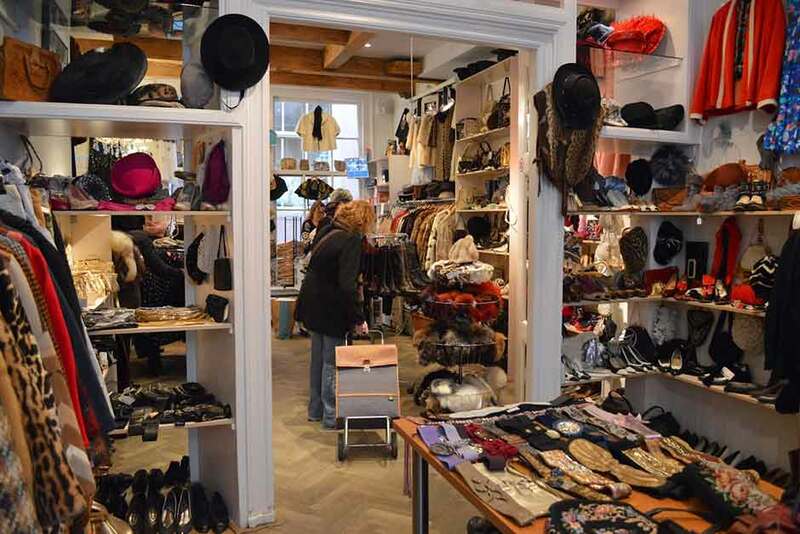 De Negen Straatjes, as they are known in Dutch, even offer an in-room shopping service. Guests can oder items online and have them delivered to their hotel – leaving more time to explore the city’s sights, its museums, or sample the finest Dutch cheese, chocolate and pancakes. Best time to go: The temperate maritime climate makes the Netherlands a good destination year-round. You might even consider visiting in the colder months, when the city is less busy. Where to stay: The Dylan Hotel occupies a canalside mansion on the edge of the Nine Streets. If you’d prefer to save more money for shopping, the Dutch have budget hospitality down to a fine art. Capsule hotel Citizen M offers small, stylish rooms, Lloyd Hotel has packages from one to five stars, and Hotel Not Hotel is a quirky, artist-designed B&B. Korean cosmetics are currently the ultimate beauty brag, so a trip to Seoul is the perfect opportunity to pick up products that haven’t yet hit the shelves of your local Sephora. Myeongdong, one of the busiest areas in Seoul, has entire blocks of K-beauty emporia like Olive Young, LOHB and Belport, as well as flagship stores for high street brands like Tony Moly, Skinfood and Too Cool for School. The obvious thing to stock up on is the highly instagrammable sheet masks for maximum fun, with minimum luggage bulk. Also keep an eye out for particularly twee packaging that will bring joy to young (at heart) beauty addicts. Speaking of cutesy souvenirs, hit up Seoul’s concept stores for knick knacks that hit the sweet spot between cutting-edge and kitsch, like Bearbrick collectibles, Pantone accessories or limited edition gadgets at Myboon (a spinoff from achingly cool Boon the Shop). Best time to go: Shoulder seasons are the ideal time to visit Korea, with spring winning out over autumn thanks to beautiful blooms and mild sunshine. Where to stay: For a beauty experience that runs more than skin-deep, check in at Hotel Prima, where the in-house sauna offers a Korean Bathhouse experience, plus beauty-boosting treatments. Stock up on guilt-free style in the sustainable shopping capital of the world. Eco awareness is so mainstream here, you’d have to be 100 per cent waste-free, climate neutral and subsist on air alone to stand out from the tree-hugging crowd... Far from dowdy eco-warrior clichés, Berlin’s green hipsters try to save the planet in style. From vegan shoes in Friedrichshain and upcycled outfits in Mitte, to entire stores dedicated to fair trade fashion in Prenzlauer Berg and organic textiles in Neukölln, local labels make green look good. For cruelty-free fast-breaking treats, head to Berlin’s “vegan avenue“ Schivelbeiner Straße and the largest animal-free supermarket in the world, or get a taste for locally produced vegan cola and plant-ingredient Donuts. Best time to go: Visit during Berlin fashion week (28-30 June 2016) to get a preview of the latest sustainable fashion trends at select public events hosted by the Green Showroom. Where to stay: Eat and sleep in sustainable style at organic vegetarian Hotel Almodóvar. The New York Met Costume Institute’s current exhibition Manus x Machina: Fashion in an Age of Technology is a celebration of machine-made haute couture, proving that technological innovation is increasingly shaping the future of high fashion. The real tech revolution, however, is happening on the West Coast. In proximity to Silicon Valley’s innovation hub, the fashion scene has young designers embracing pioneering methods of sketching, modelling and production as 3D printed dresses, shoes, and jewellery, as well as wearable technology, smart fabrics and interactive social garments emerge from San Francisco’s design studios. In 2015, the first edition of Silicon Valley Fashion Week began to consolidate the movement into a cohesive industry. Main sponsor Betabrand’s bricks-and-mortar Mission District store brings the innovative crowdsourced fashion community to life, with designs hanging on real-world racks, ready for purchase. Best time to go: There’s no guarantee for good weather in San Francisco, but autumn, (more accurately referred to as Indian Summer) is usually a beautiful time by the Bay. Where to stay: Embrace your inner nerd and revel in the tongue-in-cheek upcycled computer art, complimentary shuffleboard, ping pong table and game consoles at Hotel Zetta. Egypt boasts centuries of fragrant heritage and produces several essences used in the finest designer perfumes. For a whiff of precious perfume oils, oud fragrances and scents, ahem, “inspired” by brand-name perfumes, visit Khan el Khalili market. For those who’d prefer to steer clear of Bazaar haggling, fixed-price shops and malls also offer quality scented products, like Nefertari, a line of chemical-free cosmetics made from locally sourced natural ingredients. The brand is so committed to supporting Egyptian producers, even the packaging is made by artisans in rural communities, accelerating development whilst also making your souvenir that much more special. Best time to go: Peak season is winter, with lower temperatures, but corresponding higher prices. For bargains – on everything from hotels to bazaar shopping, come in summer. During Ramadan the festive mood and fast-breaking celebrations attract many visitors, so book ahead. Where to stay: Of Cairo’s few boutique hotels, Le Riad Hotel De Charme is the closest to both city centre and Khan el Khalili market. For a more quiet stay, splash out on a hotel with a sense of luxurious heritage at Mena House, which has hosted European royalty, American presidents, stars and artists over the past century and a half. The capital of India’s Uttar Pradesh state produces a veritable laundry list of covetable handicrafts. From intricately embroidered saris, handloomed silks and brocade, to block prints, pottery and metal work, there’s plenty to fill your suitcase with. Visitors shopping for Eid outfits will be spoiled for choice. The elaborate style influenced by Mughal culture, prevalent in signature handcrafted goods makes for excellent festive wear. Chowk in the old city is home to the best chikan market, where you can find embroidered garments or purchase unique fabrics and have them made into a bespoke design. The fair trade option is the SEWA (Self Employed Women’s Association), which supports ethical chikankari hand embroidery and is devoted to preserving traditional skills. Best time to go: With its subtropical climate and monsoonal weather, the city offers only a small window of warm but dry weather at the end of winter. Where to stay: When in Uttar Pradesh, most visitors will also want to see the Taj Mahal, but failing that, you can at least stay at the “crown” of hotels, the Taj.